In the dark hours of Friday, 25 November, Timor-Leste's National Parliament approved a $1.674 billion budget for 2012, including $1.495 billion from the Petroleum Fund. Although the MPs had eliminated $200 million the Government had proposed to kickoff the Timor-Leste Investment Company, they added $111 million in other expenditures, so the total enacted budget is $89 million less than the Government's proposal. Despite the cuts, this represents a 381% increase in the state budget during the last four years, a higher rate of growth than every country in the world except Zimbabwe. See La'o Hamutuk's website for more information on the State Budget, including documents. The United States government's Millennium Challenge Corporation (MCC) calculates a scorecard every year to determine which countries are eligible for its foreign assistance agreements, called Compacts. For the last three years, Timor-Leste has failed the test, but the changes in scores from year to year are interesting. For Timor-Leste, they show how slowly our country is improving; in some cases things are getting worse. Due to confusion about whether Timor-Leste is a "Low Income Country" or a "Low-Middle Income Country," MCC's new scorecard for Fiscal Year 2012 cannot be compared with the past two years. However, La'o Hamutuk has recalculated it to produce the graph at right and the scorecard at left. Our website describes the original and revised calculations, with links to documents and details on the indicators, methodology and history. Like all such rating systems, the MCC scorecard is flawed and sometimes fails to capture the reality of Timor-Leste, which is the second most petroleum-export-dependent country in the world, with the second-fastest-growing state expenditures. Nevertheless, La'o Hamutuk believes that indicators like this can help us understand how our economy, governance and social welfare are going, especially in comparison with other countries. We should be doing better. Monday morning, Timor-Leste's Parliament voted 30-26 (with five abstentions and four absent) to delete $200 million from the Government's proposed $1.8 billion budget, for start-up capital for the not-yet-established Timor-Leste Investment Company. Initiative politika hodi hamosu Kapitalizaun Industria Iha Timor Leste, ami la kestiona, nein kontra nia importansia no nia ezistensia. Ami apresia tebes boa vontade politika no kbit intelektual hodi hamosu konseitu ida, Iha debate orsamento 2011. Maske nune, nudar politiku nebe Iha mos sensibilidade politika, ba kestaun de konseitu dezelvolvimentu global ba povu no nasaun ida ne'e, mak ami hakarak haklaken, ami nia pozisaun politika ba publiku katak Politika kapaitalizasaun ho osan dollar juta 200, seidauk oportunu, atu hahu kedas iha tinan 2012. 1. Lei ba investimentu publiku, atu hari Impreza estatal, mak seidauk iha hodi servi hanesan kuadru legal no mata dalan, ba oinsa atu hari? ho kapital inisiu no masimu hira?se mak atu zere saida? investmentu saida mak sai preiorida? no tamba sa? investimentu ne'e, halo ho se? Iha nebe no bainhira? No mos kestaun teknika ekonomika no politika sira seluk, nebe lori ita atu ba mundu transparansia no akontabilidade estadu nian. 2. Kapitalizasaun ho osan dollar juta 200 ne'e, bot tebes atu aloka iha tinan 2012 nudar, tinan ba dezenvolvimentu demokrasia. Eleisaun presidential no parlamentar sei nesesita, rekursu no esforsu hot-hotu, ho nia finalidade lori emvairomentu foun ukun nian, no adaptasaun ukun nain sira, ba sira nia ukun ne'e rasik. 1. Tinan 2012, nudar tinan de konsolidasaun demokrasia no estabilidade. Tamba ne'e, maka rekursu no esforsu hot-hotu, diak liu oriente hodi responde nesesidade baziku no urgente hanesan; kadeira no meja ba estudante sira, irigasaun no trator ba agrikultor sira, aimoruk ho mediku ba ema moras sira, estrada, be mos no ahi ba ita hotu. 2. Ho hanoin Iha leten, mak lori ita iha diferensia tatika ba implementasaun CITL, katak guvernu hakarak hahu ohin, ami hakark hahu aban. Ne'e siknifika katak, kestaun de tempu no prioritizasaun, importansia vida moris povu no nasaun nian, mak lori ita haksesuk malu no satan malu, ba buat nebe los no justu, ba ita hotu no ba Timor nia oan, iha Timor ida deit. "....ohin tau lai osan ba Han kalan nian, no matabisu ba aban dader nian. Hafoin, la'o hakat ba eskola, no dada is iha mahon ida, iha uma nia laran, tur iha kadeira ida, no hakerek iha meja oan ida, hafoin, iha lorokraik, mak buka Internet hodi akompanha dezenvolvimentu Timor Leste nian, inkluindu CITL...". Ami konsiente katak, maluk sira nia hanoin Luan no naruk duni, maibe, ami nia hanoin mos, la klot no la badak hanesan buat nebe deputado Manuel Tilman hateten. Ita nia diferensia mak ne'e, Imi Mai ho orgulho no optimism, ami fihir ho Laran susar no todan. Laran todan atu hakat kedas ohin ho osan dollar juta 200, no laran susar, atu husik deit sira nebe halerik hodi hein ita, atu hatutan sira nia moris ohin nian, hanesan mensiona iha leten. Los duni, moris aban tenki hahu ohin, maibe, moris ohin mak han no hemu la to'o, estuda iha aihun no tur iha rai, no moras seim aimoruk, halo moris aban sei namlaek no la iha serteza. Maske nune, se proposta ida ne'e pasa ho votus maioria, ami tatoli ami nia preokupasaun. Mos, se karik projectu ne'e hetan susesu bot, ami tatoli ami nia parabens. Obrigado wa'in. We don't question the policy initiative to create capitalization for industry in Timor-Leste, nor its importance or urgency. We greatly appreciate the political good will and intellectual power to develop this concept in the 2011 budget debate. However, as politicians we are also politically sensitive to the question of the overall concept of development for this people and nation, which we want to explain, our political and public position that the $200 million capitalization is not yet opportune to start immediately in 2012. 1. The public investment law to create state businesses has not started to work as a legal framework and guidline, so how to create them? With how much initial and maximum capital? Who will manage what? What investment will be prioritized? And why? This investment will be done with what? Where and when? There are more technical, political and economic questions, which bring us to the sphere of the state's transparency and accountability. 2. Capitalization with $200 million dollars is too large to allocate for 2012, which is a year to develop democracy. The Presidential and Parliamentary elections will need everyone's resources and efforts, and result in a new leadership environment, with our leaders having to adapt to the new government. 1. 2012 is a year to consolidate democracy and stablility. Therefore, it is better to orient all our resources and efforts to respond to basic and urgent needs, such as chairs and desks for students, irrigation and tractors for farmers, medicine and doctors for sick people, roads, water and electricity for us all. 2. These thoughts lead us to a tactical difference for implementing CITL, which the Government wants to start today, and we want to start tomorrow. This means that, the question of time and prioiritization, importance for the lives of our people and our nation, brings us to some truths and conclusions that are true and fair, for all of us and for all Timorese, in our single Timor. "today put aside money to eat supper, and tomorrow morning's breakfast. Later, we go to school, live under the same roof, in the same house, sit in one chair, and write on one desk, later, in the afternoon we look for internet to accompany Timor-Leste's development, including CITL..."
We realize that some of our friends's have far-seeing, long-term ideas, but we also think, not short or narrow like MP Manuel Tilman says. Our difference is this -- you come with pride and optimism, we observe with worry and deep consideration. We feel that it is difficult to move forward quickly with $200 million. We find it troubling to ignore the cries which appeal to us, to continue their daily lives, as explained above. It's true that tomorrow's life begins today, but when life today doesn't have enough food and drink, students under the trees sitting on the ground, sick without medicine, life tomorrow will be shriveled and uncertain. Therefore, if this proposed amendment passes with a majority vote, we offer our concerns. But, if this CITL project is a big success, we offer our congratulations. Thank you. Timor-Leste is one of the poorest countries in the world, and the United States is of the richest. Nevertheless, Timor-Leste's Parliament voted yesterday to defy United States policy on Palestine, making a special contribution to UNESCO to partially compensate for the U.S. cancellation of its contribution to the United Nations Educational, Social and Cultural Organization, whose budget had been 22% financed by the United States. 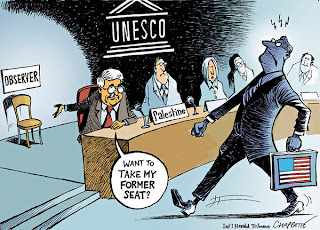 The U.S. stopped funding in response to UNESCO's 107-14 vote on 31 October to accept Palestine as a full member. Timor-Leste's Parliament is currently debating the country's State Budget for 2012. During the debate on 17 November, MP Aniceto Guterres, leader of the opposition Fretilin party, proposed to add $1.5 million to the $1.76 billion budget as a contribution to UNESCO. Guterres explained that the agency is facing a financial crisis because the U.S. cancelled their support because the agency accepted Palestine. During the debate on the amendment, some MPs expressed concerns about the political implications of repudiating U.S. policy. They emphasized that this support should be seen as a gesture of solidarity, and should not drag Timor-Leste into the political conflict facing the agency. Proponents clarified that the proposal is intended to give financial support to UNESCO, because UNESCO and other UN agencies supported TL's struggle for independence. Timor-Leste's Deputy Prime Minister Jose Luis Guterres (former Timor-Leste Ambassador to the U.S. and U.N.) and Vice Minister of Foreign Affairs welcomed and appreciated the proposal as gesture of solidarity, and the amendment was approved with 34 votes in favor, five opposed and 15 abstentions. Debate on the budget will continue for another week, and more information is on La'o Hamutuk's website. Timor-Leste's Constitution states that the nation "shall extend its solidarity to the struggle of the peoples for national liberation." On 22 November 2011, the United Nations Security Council discuss UNMIT. La'o Hamutuk wrote to call Council's attention to some information and concerns. A slightly abridged version follows below, the original has footnotes but not links. The Timor-Leste Institute for Development Monitoring and Analysis (La’o Hamutuk) is a local civil society organization which has monitored and analyzed the mandates and activities of the United Nations in Timor-Leste since 2000, during four UN Missions. We frequently meet with UN officials and write to the Security Council, especially about the still unfulfilled promise by the international community to end impunity for crimes against humanity committed during the illegal Indonesian occupation between 1975 and 1999. We have studied the Secretary-General’s recent report on UNMIT (S/2011/641) from January through September 2011 and would like to share some observations with you before your debate next week. We believe that the report leaves out some important issues, and would like to try to help give the Council a broader, deeper understanding of the situation in Timor-Leste and UNMIT. The Secretary-General’s report is optimistic about the consolidation of peace, stability and development in Timor-Leste. That optimism is based on assurances by political and State leaders, superficial progress of the situation, and the efforts by the UN and other agencies to consolidate peace and stability through institutional and capacity building. Unfortunately, there is often a gap between leaders’ words and what most citizens experience every day. Considering current realities here, the positive steps taken by UNMIT, other agencies and Timor-Leste’s government in recent years do not fully address people’s essential and long term needs. Continuing impunity for past crimes undermines peace, stability and development. When accountability is ignored, institutional consolidation alone cannot overcome weaknesses which threaten to undo the accomplishments of UN missions in Timor-Leste over the last twelve years. We regret that the current report appears not to understand this fundamental principle. The 2006 crisis should teach us a lesson, and similar crises can arise in future if impunity continues to flourish. Although the UN and others previously highlighted impunity for 1975-1999 crimes and the 2006 crisis as a cause of future instability, that lesson may have been forgotten. Even with functional state institutions working to maintain peace, stability and justice, the lack of accountability is a time bomb that can explode at any time. Stability requires every citizen to comply with the rule of law, and that everyone is confident that others will also do so. As we discuss below, impunity undermines this bedrock of democracy. We regret that the Secretary-General’s report and UNMIT itself fail to give enough attention to atrocious sanitation, nutrition and health care that kill and injure far more people than causes which can be addressed by soldiers and police officers. We encourage the Security Council to give more attention to human resource development (education and health), agriculture and non-oil industrial development which can free this country from import dependency and reduce poverty sustainably, over the long term. Unfortunately, the National Priorities and Millennium Development Goals deal more with organizational structures than effective measures, and budget allocations by Timor-Leste’s government and development partners fail to comply with these priorities or adequately address these goals, spending the lion’s share of their resources on physical infrastructure and policing. The Millennium Development Goals-Suco program to build five houses per year in each sub-village is problematic. Not only is it costing more than twice the budgeted amount, but the use of imported, prefabricated houses undercuts local industrial and economic development and the sustainability of these homes. La’o Hamutuk discussed this in our recent submission to Parliament on the proposed State Budget for 2012. We appreciate the publication of the long-awaited 2011 UNDP National Human Development Report Managing Natural Resources for Human Development: Developing the Non-Oil Economy to Achieve the Millennium Development Goals, but regret that UNDP retreated when the Government attacked the report, removing it from UNDP’s website (it is still available from La'o Hamutuk) and failing to publish a Tetum version. The Secretary-General’s report mentions that state expenditures are driving strong economic growth, but fails to discuss inequalities inherent in this growth, which is largely concentrated in the capital and among companies receiving government contracts. The living conditions of the majority of our people, outside the capital and not among the upper class, have barely improved or gotten worse. Although cash transfers have helped some avoid starvation, this will be unsustainable when already-declining oil and gas revenues run out in about 12 years. 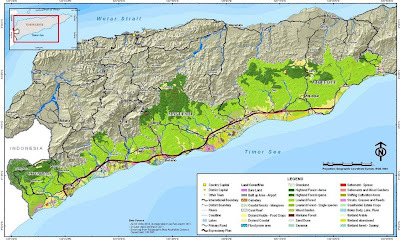 Timor-Leste’s non-oil private sector today consists almost entirely of subsistence agriculture, importers and government contractors. If local production to replace imports and add value to agricultural products is not improved, poverty will increase drastically when the oil revenues run out. Timor-Leste’s total petroleum wealth could pay for public spending equivalent to $1.72/citizen/day for the next 40 years. The proposed $1.76 billion 2012 budget, a 35% increase over 2011, will spend at more than double that rate, and is enabled only by nonrenewable petroleum revenues. Timor-Leste has a billion-dollar non-oil trade deficit in goods and services; how can this continue after the oil and gas are used up? La’o Hamutuk has expressed concerns about the new TimorGAP National Oil Company and the proposal to develop the “Tasi Mane” southwest coast petroleum infrastructure corridor. We believe that they are misguided and will not help Timor-Leste escape petroleum dependency, and encourage the Security Council and UNMIT to support Timor-Leste’s sustainable, non-oil development. During the last decade, UN missions around the world, including in Timor-Leste, have learned lessons about drawing down and preparing for their termination. We hope that the UNMIT withdrawal from Timor-Leste next year will gain from these experiences. In particular, we urge continuing UN engagement in areas of economic development and human rights. During the last 13 years, the UN has taken some actions to reduce impunity for crimes against humanity committed during the Indonesian occupation. This Council established the Serious Crimes Unit and Special Panels in 2000, but their mandate was unfortunately restricted the last ten months of the 24-year illegal occupation. The SCU indicted 391 people but was only able to bring 87 (all Timorese) to trial, convicting 84. The rest are shielded from accountability by Indonesia, and the UN has not taken effective action to end this violation of international law. Unfortunately, the UN is not following its own principle – reaffirmed by the nations of the world in the Rome Statute – never to tolerate enduring impunity anywhere in the world. This betrayal is especially egregious in Timor-Leste, both because of the pervasive, prolonged nature of the crimes and because they were committed by agents of one state against citizens of another. The UN Security Council and General Assembly explicitly condemned them numerous times between 1975 and 1999. As we move toward the end of UNMIT’s mission next year, the UN has unacceptably circumscribed the scope of UNMIT’s work to end impunity. In 2006, Security Council Resolution 1704 instructed UNMIT to finish investigations for 1999 cases not completed by the Serious Crimes Unit, establishing the Serious Crimes Investigation Team (SCIT) with no mandate to issue indictments or prosecute alleged perpetrators. Even if SCIT finishes its work before UNMIT ends, there is no avenue to achieve accountability. Indonesian officials continue to obstruct justice, and Timor-Leste’s leaders – responsible for a tiny, new nation which has suffered horrendously from crimes by its western neighbor – remain cautious without credible assurance of international support. The July conviction and sentencing to nine years imprisonment of Besi Merah Putih militia member Valentim Lavio was not successful because the prolonged process and lack of pre-sentencing detention allowed him to flee to Indonesia; his co-indictee also remains at large. Once again, failures of the international community to prevent impunity have enabled a criminal to escape accountability. Consider Timor-Leste as a test case for accountability for crimes against humanity, creating an opportunity to redeem the name of the United Nations by showing that the institution and its member states are serious about their promise never to tolerate impunity. One initial step would be to discuss and act on the recommendations of the 2005 Commission of Experts, which include the creation of international mechanisms when national ones are incapable of achieving accountability. In addition, the Security Council could extend SCIT’s mandate and duration to include investigating and prosecuting serious crimes committed as part of the Indonesian occupation of Timor-Leste between 1975 and 1998, and allocating sufficient resources to this task. Assist Timor-Leste’s economic development in a realistic, sustainable way which does not depend on temporary and capital-intensive petroleum infrastructure. In addition to supporting Government priorities and programs, the UN can provide expertise and longer-term perspectives for long-term, non-oil development. In particular, the UN could help Timor-Leste to develop its human resources – especially education and health care – to enable its future development. Remember that during 2012, Timor-Leste’s government and citizens will be dealing with many pressing issues in addition to elections and UNMIT withdrawal, and look for ways that the United Nations and the international community can avoid neglecting other critical concerns. UNMIT is likely to leave Timor-Leste a little over a year from now, but more than a million Timorese people will continue to live here, and deserve better support from the international community than they have received during the last 36 years. On 9 November, Timor-Leste's Parliament began debating the $1.76 billion proposed state budget for 2012, a 35% increase over last year and the fastest-growing budget in the world (except for hyperinflation-plagued Zimbabwe). The Prime Minister presented the budget, and Parliament's Economics Committee C presented its report (Portuguese original). Committee C's in-depth report includes hundreds recommendations from the other Parliamentary Committees. Committee C itself questions the macroeconomic foundations of the budget, its economic policy objectives, its excessive reliance on petroleum revenue, poor management of treasury funds and promotion of Public-Private Partnerships. The Committee asked for more information and studies before contracting public debt, and recommended better monitoring and control of the Petroleum Fund. It urged that the non-oil deficit not grow faster than non-oil GDP and encouraged development of the non-oil economy. After listing the possible benefits from a massive local housing construction project, the Committee lamented that the Government's plan did "not meet any of the criteria described" and would have no multiplier effect, with negative impacts. La'o Hamutuk raised many of these concerns in our submission to the Committee a few weeks ago, and we appreciate that the Parliamentarians agree with our analysis. La'o Hamutuk's budget web page continues to provide comprehensive budget information, documents and analysis from all sources, including the two linked to above. We recently published two articles in local newspapers: Orsamentu Jeral Estadu 2012 ha’belit liu tan Malisan Rekursu ba Timor-Leste and Compania Investimentu Timor-Leste, Investe ka Fakar Osan? The Ministry of Finance has also opened a web page on the daily budget debate, which is being broadcast live on TVTL. While we welcome the additional transparency, we regret that the Ministry's page includes only material issued by the Government. On 2 November, the United Nations Development Program (UNDP) released their 2011 Human Development Report, entitled “Sustainability and Equity: A Better Future for All.” In addition to the thematic discussion and data on health, education, gender, economics and other factors, the UNDP calculates a “Human Development Index” (HDI) for each country. The HDI combines life expectancy, education (school enrollment) and gross national income (GNI) to produce a composite measure of human development. The 2011 HDI for Timor-Leste is 0.495, which attempts to describe the situation here in 2009, and gives Timor-Leste a rank lower than 147 out of 187 countries with data. This is essentially the same as last year, when a score of 0.491 produced the same rank. Comparing HDI scores from different years is challenging, as UNDP often changes the methodology used to calculate them, as shown in the above graph and explained on La'o Hamutuk's website. Unfortunately, reliable statistical data on this country is hard to get, and the 2010 census results were released too late to use them. Similarly, economists have to depend on projections from 2007 until the living standards survey currently in process is published in 2012. Even more problematic, the HDI for Timor-Leste still uses 2001 information about expected years of schooling; rendering the education component of HDI meaningless for analysis over time.The health component of Timor-Leste's HDI -- life expectancy -- is extrapolated from the 2004 census, and therefore doesn't reflect events during the past seven years. Timor-Leste's HDI essentially represents oil and gas revenues -- increasing as production ramped up in 2005-2008, and declining as inflation erodes purchasing power in recent years. La'o Hamutuk is concerned about the attention given to numbers generated by flawed methodologies, as well as with politically-motivated boasts and attacks which often defy credibility. We know that Timor-Leste has many people in poverty, that we are still nearly entirely dependent on imports, and that local economic and agricultural production is far below where it should be. Looking around, we see unacceptable levels of education and health care and a budget which prioritizes physical infrastructure over human development. Our only producing oil and gas fields will run dry in 12 years, and we don't need numbers to understand what that means. Petroleum income pays for 90% of the state budget, which is growing faster than every country except Zimbabwe. We do not understand or agree with the Court’s concluding Opinion that the state accounts are valid. The court identified too many fundamental flaws, and we describe several others below, to reach this conclusion. The Court should have been given more information than the Government provided, as the current Opinion points out. We encourage Government to be more forthcoming to the Court, Parliament and the public. We support the Court's recommendations for a more disaggregated, comprehensive and accurate system to manage and report on state finances, as well as for better systems for reconciliation and control of cash. Rapid budget growth is a symptom of the resource curse. During 2008-2012, Timor-Leste’s State Budget grew faster than any nation in the world except Zimbabwe, and it is not sustainable, manageable or producing good results. The 2010 mid-year budget was an extreme case, which transferred a lot of money out of the Petroleum Fund without a valid reason, sacrificing future generations for current greed. Taking more than the Estimated Sustainable Income (ESI) from the Petroleum Fund for short-term convenience violates both the Petroleum Fund Law and good policy. It is illegal to withdraw money from the Petroleum Fund merely to increase the balance in the Treasury account for the following year. During December 2010, the Ministry of Finance directed the BPA to transfer $211 million from the Fund, although the Treasury contained enough for several months’ expenses. At the end of the year, the Treasury Account held $340 million dollars, the highest amount in Timor-Leste’s history. The Court recommended that donor assistance be included in this review and in the State’s budget execution reports. We do not share this view, except for possible future direct budgetary support from donors. The Court mentions evidence of possible violations of law. We hope that they provide full information to the Anti-Corruption Commission. The end-of-the-year budget execution rush is bad policy. The graph at right shows the 235 contracts over $250,000 that Timor-Leste signed during 2010, totaling nearly $700 million. Nearly half (107) were signed during November and December. Hasty spending before the fiscal year ends often leads to waste, corruption and poor outcomes. The Court should have discussed the largest outlay in 2010, the national electricity project. La’o Hamutuk has written extensively about this debacle, but we remain hopeful that Timor-Leste will learn from it. Timor-Leste signed a $330 million (later increased to $406 million) contract without competitive bidding on 15 September 2010 with Puri Akraya Engineering to build the power stations. The previous December, Timor-Leste’s largest contract ever ($367 million) was signed with Chinese Nuclear Industries No. 22 (for the same power plants and the national high voltage grid), which was reduced to $298 million when PAE was contracted. These two contracts totaled $629 million at the end of 2010 (they are still increasing; today the total project cost is around a billion dollars and rising). Parliament had not approved the outlays obligated by these contracts, which are ten times more than the 2010 budget says. The 2010 mid-year budget adjustment appropriated $60 million for this project during 2010 (budget execution reports say that $90 million was spent), but omitted multi-year costs. The original 2010 budget gives a project cost of $48 million, with no expenditures listed after 2010. To avoid repeating similar violations, we encourage Government to implement a system to provide accurate information to Parliament and the public about total expected costs of multi-year projects and future contractual obligations, including alterations while the projects are being implemented. We discussed many of these issues in more detail in our submission to Parliament last week on the proposed 2012 State Budget. Argentinian torture survivor and human rights activist has been in Timor-Leste for a few weeks, meeting with victims, justice campaigners and officials in Suai, Maliana and Dili, sharing her experience of a successful, 33-year struggle to bring her torturers to justice. Although she was 'disappeared' in 1976 and imprisoned for more than two years, it took until 2009 for an Argentinian court to convict six of "her" perpetrators and sentence them to long prison terms. Patricia will share her experiences in a public meeting "Forgetting Past Crimes Strangles Justice Today and Tomorrow." The meeting, which is free and open to the public will be in Tetum and English. Patricia Isasa: "Strategies and Challenges in Struggling for Justice"
Ines Martins: "Justice for Timor-Leste is still an Unresolved International Obligation"
Relasiona ho Visita Aktivista Justisa Sra. Patrisia Isasa mai iha Timor Leste iha fulan ida nia laran, atu fahe ninia esperensia no ninia hanoin konaba luta kontra Ditadura Militar iha Arjentina iha tempu neba to hetan duni justisa ba ninia an hodi hatama autor nebe halo violensia kontra nia no povu Arjentina ba Tribunal to tama ba Komarka. Bazeia ba esperensia nebe mak Timor Leste mos infrenta iha tempu pasadu iha okupasaun Indonesia nia ukun ho Ditadura Militar, ami husi Lao hamutuk organiza Enkontru Publiku iha Dili ho topiku jeral “Haluha Krime Pasadu, Hamate Justisa iha Agora no Futuru”. Ba Enkontru publiku nee, ami nakloke hodi konvida ita boot sira atu mai partisipa hodi rona no mos fahe Esperensia ba malu atu nune ita hamutuk luta ba hakotu korenti Impunidade nebe mak agora buras iha rai doben Timor Leste. Ines Martins husi Lao Hamutuk : ho topiku Justisa ba Timór-Leste Nafatin Nu'udar Obrigasaun Internasionál ida ne'ebé Seidauk Atínje. Timor-Leste Parliament's Committee C (Economy) held a hearing on the proposed 2012 State Budget last Friday, with testimony from La'o Hamutuk and other NGOs. The “Dutch disease” of inflation, currently over 13%, exacerbates poverty in Timor-Leste. We continue to neglect non-oil development and depend on imports. Our people are our most important resource, but the budget will cut the share for health and education while infrastructure mega-projects get most of the money. Timor-Leste is a world leader in budget escalation, with a 407% four-year increase second only to Zimbabwe. The budget will spend 7.2% of our petroleum wealth from the Petroleum Fund, more than double the Estimated Sustainable Income. By 2014, Petroleum Fund withdrawals will be larger than oil revenues deposited into the Fund. Special Funds continue to erode Parliamentary authority, and the Budget documents are not accurate or complete about how the Infrastructure Fund is being used. Parliament needs complete information on expected project costs, such as the $950 million national electricity project, the $1.4 billion south coast highway, and other elements of the Tasi Mane petroleum infrastructure project. Electricity continues to dominate, receiving more than $370 million, with results lower than expectations. Agriculture deserves more than 1% of the budget, since it is the livelihood of more than 80% of our population. Parliament needs more information before approving borrowing. This budget is the first request to authorize loans, $33 million, but future loans will be much larger. The Timor-Leste Investment Company gets $200 million, which may be squandered on futile, useless, money-losing projects. For the last few years, La’o Hamutuk reported on the most expensive Government project in Timor-Leste’s history. The ill-conceived, poorly-planned, mismanaged and badly implemented national electricity project includes two heavy oil power plants and a high voltage grid. Even if there are no more cost overruns, this project will cost Timor-Leste more than $950 million dollars to construct ($443 million has already been spent) – plus hundreds of millions more for fuel, operation and maintenance. Timorese policy-makers think big, and the electricity mega-project is about to be eclipsed by the South Coast Highway between Suai and Beacu, part of the Tasi Mane petroleum infrastructure corridor. Cars and 10-ton trucks will speed along its two carriageways at 100 km/hour, completing the 152-km trip in less than two hours. 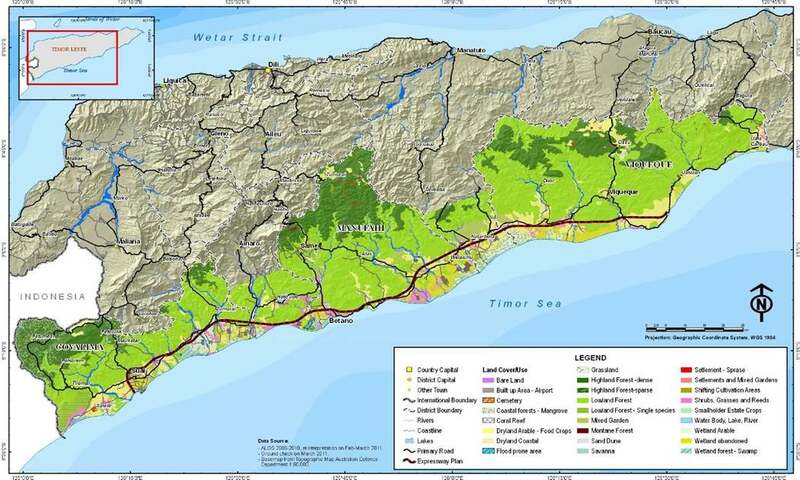 Timor-Leste paid PT Virama Karya nearly a million dollars for a “Preliminary, Detailed Design and Environmental, Social and Economic Assessment” of this road, which was done in association with Multi Arch, LDA. A few weeks ago, the consultants presented their 75-volume report to the Government. They estimate construction costs at $9.2 million per kilometer (about 20% less than similar roads in Indonesia) for a total outlay of $1.39 billion. The proposed 2012 State Budget describes some of the expenditures for this project, although we believe they are understated (see table at right). This total, $767 million, is about half of what Virama Karya says the road will cost. If may be intended to pay for just a single carriageway, as the Strategic Development Plan suggests that the lanes may be built one at a time. La’o Hamutuk estimates that the total cost of the road during its 30-year life (including construction, loan interest, and maintenance) will be $1 billion for a single-carriageway road, and $1.7 billion if both carriageways are built. One way to recover some of this money would be to charge tolls on this highway, although this seems unlikely given the Government’s decisions to reduce fuel and import taxes and to subsidize electricity users. If motorists paid tolls about the same as are charged in Indonesia (about 4¢/km for cars and 12¢/km for trucks), the state could recoup about 10% of its outlay. The money which will be spent on this highway – more than $1,000 for each Timorese citizen and more than two years of our non-oil GDP – could do a lot for the education and health of our people, building human resources which could sustain Timor-Leste for generations. Petroleum revenues enable the “resource curse,” and petroleum-fueled vehicles justify an "Easy Street" for spending them. This page is condensed from a fuller discussion on La’o Hamutuk’s website, which links to the budget documents and includes more information and graphics. On 21 October, La'o Hamutuk presented a submission on the State Budget to Parliament's economics committee. Last week, Timor-Leste’s Government presented Parliament with a proposal to spend $1.76 billion during 2012, including $1.56 from the Petroleum Fund and $33 million in foreign loans.Timor-Leste's proposed 2012 budget is 35% larger than 2011, and is more than five times as large as the 2008 budget proposed four years ago. According to the IMF, Zimbabwe (with runaway inflation) is the only country in the world whose state budget grew faster during this time; Congo (DRC) places third with an increase of 3½ times. The budget violates the principles of sustainable use of the Petroleum Fund, although it explains that Bayu-Undan oil and gas production is declining. The projected 2013 budget will spend as much from the fund as oil revenues will bring in.This year's Estimated Sustainable Income (ESI) is $665 million. This is $69 million lower than last year's, because the Government overspent the ESI during 2011 and because ConocoPhillips expects higher Bayu-Undan operating costs and lower future production. However, every state budget since 2009 has broken the 3% sustainable spending rule, which has more to do with public relations than with policy. The proposed budget includes $33 million in loans for water and roads during 2012, with more in future years. This is the first time the Government has asked Parliament to approve borrowing. The budget proposal "does not show repayment because most of the loans have a ten year grace period." Over the next four years, the budget anticipates borrowing $447 million dollars. This is a small fraction of what will probably be needed to implement the Strategic Development Plan, but full information is not given. We urge the Government to provide information on the full costs of mega-projects like the Suai-Beacu highway before Parliament approves the budget and the loans, rather than repeating the mistakes of the Heavy Oil project. In the 2012 budget, capital expenditures for electricity are $282 million (down from $447 million in 2011), although the new power plants require more money for generator fuel, from $46 to $89 million. Notwithstanding the increases in generating capacity and prepaid meter installations, EDTL gross revenues only to go up a little, from $14.5 to $16.1 million, requiring a $73 million subsidy (not including hundreds of millions in capital costs). The Infrastructure Fund allocates $163 million to the Tasi Mane south coast petroleum infrastructure project. More than half of this is to build the Suai supply base for offshore oil operations, which is budgeted at $329 million between 2011 and 2014. The Government has just appointed Eastlog Holdings PTE to construct the supply base, which will become the property of the new TimorGAP national oil company. Another $45 million is allocated during 2011 for the Suai-Beacu highway, which is budgeted to absorb $547 from the Infrastructure Fund and $220 million in loans between now and 2016. Timor-Leste 2012 State Budget continues to neglect Timor-Leste's human resources essential to economic development and quality of life. Only 6.3% of state expenditures will go for education, and only 2.9% for health. UNDP recently pointed out that countries making progress toward the MDGs spend about 28% of their budgets on education and health, concluding that “not enough priority is being accorded to education and health. If Timor-Leste is to move faster in achieving the MDGs in these areas, then the share of social services in the budget will have to be virtually doubled.” The 2012 budget moves in the opposite direction, reducing the budget allocation for these social services from 9.6% of the 2011 budget to 9.2% for 2012. The Decree-Law establishing a state-owned investment company went into force two weeks ago, and the Timor-Leste Investment Company (CITL) will be capitalized with $200 million from the 2012 State Budget. CITL is intended "promote the development of investment opportunities and national wealth growth, leading important strategic projects with significant commercial impact." Like Singapore’s Temasek, “CITL is a state owned enterprise with profit seeking objectives. It is owned by the Government but functions on a commercial basis." CITL is empowered to incur debt by issuing bonds; it can also purchase shares in other companies. Iha loron 21 Outubro, La'o Hamutuk hato'o submisaun kona ba OJE2012 ba Parlamentu Nasional. Orsamentu Jeral Estadu ba tinan eleisaun 2012 nian haksoit sai maka’as liu 35% ba orsamentu estadu 2011 ne’ebe maka’as mos. Proposta orsamentu biliaun $1.76 ne’e inklui imprestimus kiik primeira vez ba Timor-Leste. Mayor parte rendimentu ba orsamentu ne’e mai husi Fundu Petroleu ho montante biliaun $1.59, maske estimasaun Governu ba rendimentu sustentavel ne’ebe atu foti husi Fundu Petroleu iha biliaun $0.67 deit. Governu aprezenta orsamentu ba Parlamentu iha Sesta-Feira semana kotuk, hodi hadiak pratika pasadu, hodi publika tiha ona iha website Ministeriu Finansas. Ami rona katak ida ne’e akontese tamba iha preokupasaun katak website La’o Hamutuk bele sai tan fontes de facto ba Orsamentu Estadu. Ami sente orgulhu hodi partisipa iha kompetisaun ida ne’e, no publika ona tan dokumentus orsamentu nian ida ne’ebe fasil atu bele asesu ba iha pajina web la’o Hamutuk nian kona-ba orsamentu estadu 2012 (mos iha Ingles), ne’ebe sei inklui analiza no komentariu durante iha semana balun oin mai. Soaring 35% above the already huge Timor-Leste State Budget for 2011, the proposed $1.76 billion State Budget for election year 2012 includes a little borrowing for the first time. The bulk of its revenue, $1.59 billion, comes from the Petroleum Fund, notwithstanding the Government's estimate of the sustainable withdrawal (ESI) from the fund at only $0.67 billion. The Government presented the budget to Parliament last Friday and, in an improvement over past practice, has already posted the budget documents on the Ministry of Finance website. We have heard that this welcome increase in transparency is because they feared that La'o Hamutuk's website would again become the de facto budget source. We're honored to participate in that competition, and have posted the budget documents in a more accessible form to La'o Hamutuk's page on the 2012 budget (also Tetum), which will include analysis and commentary over the next few weeks. On 7 October, we blogged a summary of some key issues in this budget.